According to her mom, blogger Christy Keane, baby Charly was born "profoundly deaf." 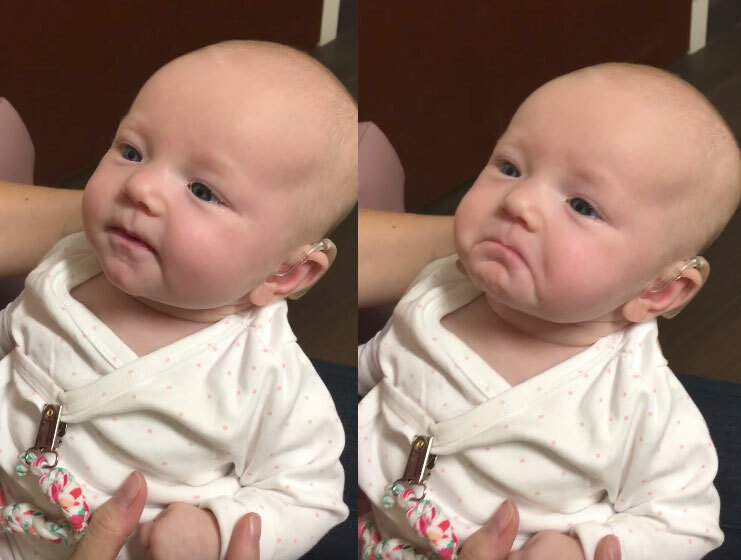 In this truly heartwarming video, you'll see this precious child responding to her mom's voice for the first time ever through the miracle of hearing aids. Charly gets quite emotional and seems unsure whether to smile or cry. Who can blame her? On Instagram, Keane writes, "We didn't think she would hear anything so this was more incredible than I can put in to words." The role that teachers play in influencing the lives of their students is something that's been lost in current debates about education mandates and standardized testing. Teaching isn't just about making sure kids can pass exams. It's also about helping future adults find their gifts, discover their interests, and learn who they want to be. That's a hard thing to quantify. You can't really put together a concise list of "Children I've Inspired" for a CV. But this is the part of a teacher's job that is the most lasting. What we remember about good teachers isn't necessarily the dry facts they taught us, it's the doors they opened, the curiosity they kindled, and the moments where they made us rethink everything. Science journalist Steve Silberman is married to one of America's hard-working teachers. Watching his husband, Keith, inspired Steve to collect stories of how teachers shaped the lives of a wide range of writers, thinkers, and scientists. In a post on Steve's blog, you'll find stories from people like award-winning journalist Deborah Blum, cultural critic Mark Dery, and molecular biologist Bonnie Bassler. I'm honored to be a part of this line up, as well. Below is my contribution, dedicated to the grade school teacher who made me the person I am today. I had the same teacher for 4th and 5th grades, Shirley Johannsen. She started teaching at State Street Elementary in Topeka, Kansas in 1963, so by the time I met her in the late 1980s, this woman was already educating the children of her first students. This is a seriously incredible story. If you did not already kind of love Carl Sagan, and think of him as a sort of benevolent hippie grandpa, you totally will now. And the message here is seriously spot-on: The best way to honor the people who helped you realize your dreams is to help somebody else realize theirs. [Video Link] This is a fascinating 15-minute video that shows a hunter-gatherer tribe in Papua New Guinea meeting with people from the outside world for the first time. They are very cautious, but also very curious, about the man on the other side of the river. They eventually cross the river to meet Jean-Pierre Dutilleux, the producer of Tribal Journeys: The Toulambi. When the men see Dutilleux's clothing, they then look at the clothes they are wearing, as if for the first time. When they stroke Dutilleux's hair, they then stroke their own hair. Richard Dawkins on vivisection: "But can they suffer?" The great moral philosopher Jeremy Bentham, founder of utilitarianism, famously said,'The question is not, "Can they reason?" nor, "Can they talk?" but rather, "Can they suffer?" Most people get the point, but they treat human pain as especially worrying because they vaguely think it sort of obvious that a species' ability to suffer must be positively correlated with its intellectual capacity. Plants cannot think, and you'd have to be pretty eccentric to believe they can suffer. Plausibly the same might be true of earthworms. But what about cows? What about dogs? I find it almost impossible to believe that René Descartes, not known as a monster, carried his philosophical belief that only humans have minds to such a confident extreme that he would blithely spreadeagle a live mammal on a board and dissect it. You'd think that, in spite of his philosophical reasoning, he might have given the animal the benefit of the doubt. But he stood in a long tradition of vivisectionists including Galen and Vesalius, and he was followed by William Harvey and many others (See from which this picture is taken). Last week, the Japanese utility company Tepco released photos taken of the March 11 tsunami as it struck the Fukushima Daiichi nuclear power plant. Out of the two sets of shots, this photo, in particular, caught me cold. From this angle, the wave looks like such a small thing, doesn't it? Over the weekend, I read several beautifully written, deeply moving essays about the deadly line of tornadoes that swept through Alabama last week. I wanted to share a few of those essays here, as well as let people know where you can donate to help the many, many people left homeless by this disaster. First, my old Alabama buddy Kyle Whitmire wrote a piece for CNN called "When a Monster Came to Alabama". You look for the "debris ball" that means a twister is on the ground. And when they get close, you hide in a windowless room, closet or hallway. If you're on the road, you're supposed to pull off and hide in a ditch, although I'm not sure many folks actually do. Then you wait. Maybe it kills you. Probably it doesn't. When it's over, you call your family to say you're safe and ask them if they're safe. And then you look around outside to see if it's all still there. More than 100 individual tornadoes struck the Southeastern United States yesterday. More than 200 people were killed in Alabama alone. I lived in Birmingham for two years, working for mental_floss magazine. I'm happy to report that all of my friends—including the mental_floss staff—are present and accounted for. But even for those who got by relatively unscathed, there's a lot of work to be done. The clean-up from this disaster is turning out to be remarkably disturbing. Many of my friends have reported finding strangers' belongings and pieces of demolished homes in their yards. In several cases, debris found in the Birmingham metro area appeared to have come from Tuscaloosa—some 60 miles away. In the wake of that, someone's set up a new Facebook group where people are posting scans of photos and documents they've found post-tornado. Partly, it's meant to help reconnect keepsakes and belongings with their owners. And partly, it's a deeply moving memorial. There's little doubt that at least some of the people in these photos won't be able to come collect them. My thoughts are with everyone down South tonight. I hope you, and the people you love, are safe. Photographer Martin Usborne has a wonderful project titled Mute: the silence of dogs in cars. Most of the images were taken at night. Above, a piece from the series titled "Peggy." I was once left in a car at a young age. I don't know when or where or for how long, possibly at the age of four, perhaps outside Tesco's, probably for fifteen minutes only. The details don't matter. The point is that I wondered if anyone would come back. It seems trivial now but in a child's mind it is possible to be alone forever. Around the same age I began to feel a deep affinity with animals - in particular their plight at the hands of humans. I remember watching TV and seeing footage of a dog being put in a plastic bag and being kicked. What appalled me most was that the dog could not speak back. Its muteness terrified me. Just noticed this powerful advertisement from the Topsy Foundation. It was one of the winners at TED's "Ad's Worth Spreading" contest, which is generally worth checking out. This particular video does a great job (with a lovely twist at the end) at showing the effectiveness of HIV antiretroviral drugs (ARVs). There's also a followup video you can view that checks in on the woman (Selinah) as well as chatting with the folks behind the video. Although I realize that the ARVs have been made possible by the work done in the pharmaceutical industry, and that there is a chance that Topsy's programs are facilitated by kind donations from the same industry, it's still a pity that there isn't a more sustainable system for the provision of such drugs to developing countries. Pity that these sorts of medicines are usually priced way too high for individuals like Selinah, which is why so many go untreated and so many die. Pity also that laws like Bill C-393 (which aim to explore different ways to create that sustainable market and lower that price) are being deliberately stalled in government so as to guarantee not being passed. This video contains excerpts of the reaction of the mother chimpanzee to the body of her deceased infant. The video was recorded at Chimfunshi Wildlife Orphanage Trust in Zambia. A full report of this event is in press in the American Journal of Primatology (DOI: 10.1002/ajp.20927). This report was a collaborative effort between the Max Planck Institute, Chimfunshi, and Gonzaga University. What makes Mt. Merapi different from other volcanoes? This is what happens when your kitchen meets a nuée ardente. Literally a "burning cloud", the name is French for pyroclastic flow—a mass of hot gas, ash and rock released in some volcanic eruptions. Basically, it's an avalanche that happens to be hot enough to sear flesh. The danger of these things is that they move fast—hundreds of miles per hour, in some cases—and that they hug the ground, burning and suffocating everything in their path. Almost all the big, famous eruptions—from Mt. Vesuvius to Mt. St. Helens—included pyroclastic flows. And so have the recent eruptions at Mt. Merapi in Indonesia. In fact, these things happen so often at Mt. Merapi that the Mountain has become the namesake of a specific type of pyroclastic eruption, different from the ones that buried Pompeii and the Toutle River. You're probably most familiar with Pelean-type eruptions. Named after the volcano that flattened the Caribbean town of Saint-Pierre in 1902, these eruptions are often phenomenally destructive. Pressure builds up for decades under a dried lava "cork". When the lava dome collapses and the cork finally pops, the pyroclastic flows spill out—fast and furious. Baby animals: Boy, they sure are cute! Behold! A positive application of the old saying, "What is seen can never be unseen." WARNING: The images in this gallery are dangerously, addictively cute. Once you have seen them, you will want to see more, and more. And more. And you may never finish what you were working on before you saw them. But it's probably too late for you anyway, because you've already seen the baby ocelot, so never mind. What's it like to be incarcerated in a US prison? Guestblogger Andrea James signs off @boingboing for now. Thanks!